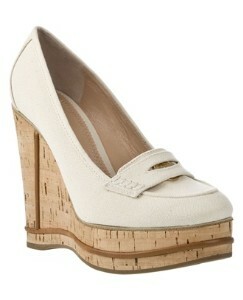 Chloe's ivory canvas wedge loafers retailed for $525 at Far Fetch but are no longer available. Express has a great alternative if you're on tighter budget, retailing for an affordable $34.93 on sale. You can click on the photo below to purchase or for more information (also available in denim). *Update - 3/22/11* - I found another option for the Chloe wedges and wanted to post. These Nine West wedges retail for $89 and you can click on the photo below if you're interested in purchasing! I just checked the website and they are even cheaper! 34.93!